Dear friends, on behalf of the Restore Inner West Line – Community Action Group and volunteer teams. We would like to thank our supporters and Tania Mihailuk MP for the many years of fighting for better public transport. No matter what the election result is, our community needs Restore Inner West Line – Liverpool via Regents Park and we will continue to campaign for genuine public transport improvements including Save T3 Bankstown Lineand Fast Trains for Lidcombe, Auburn, Clyde & Granville. Berala and Regents Park now have trains every 15 minutes (double the number of services in 2013), this has only been possible from the strong community action from local residents and former Auburn MP Barbara Perry. Cabramatta was to be terminal of the T3 Bankstown Line once the Sydnenham-Bankstown Metro Southwest was constructed, removing the link with Liverpool. However after exposing the plan for further Bankstown Line cuts and a government spokesperson giving a false statement to the media, we are glad to have successfully fought back against this attack on our public transport. With the government’s 2017 timetable changes completely undermining its excuses and lies about the necessity to cut the Inner West Line at Homebush, we have uncovered that plans to upgrade the railway have been abandoned in favour of the re-introduction of tolls (WestConnex). The cuts to the Sydney Trains network have hit the Cumberland Council Sydney area the hardest over the past 6 years highlighting Gladys Berejiklian and Andrew Constance MP‘s prejudice against Western Sydney. 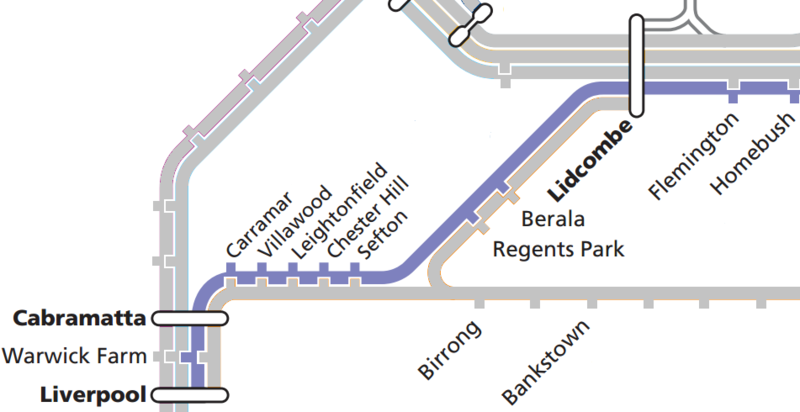 To this day, Transport for NSW still cannot provide any evidence that removing the City to Liverpool (& Bankstown) via Regents Park service in 2013 actually improved reliability on other lines. We will continue to fight for better transport especially Restore Inner West Line – Liverpool via Regents Park, Fast Trains for Lidcombe, Auburn, Clyde & Granville, Save T3 Bankstown Line, Protect Our Rail – Bankstown Lineand Save Gazzard Park – No to Metro Southwest. Also a big thank you to The Battler, Sydenham to Bankstown Alliance, No WestConnex: Public transport not motorways and EcoTransit Sydney for the help and highly appreciated support over the many years. 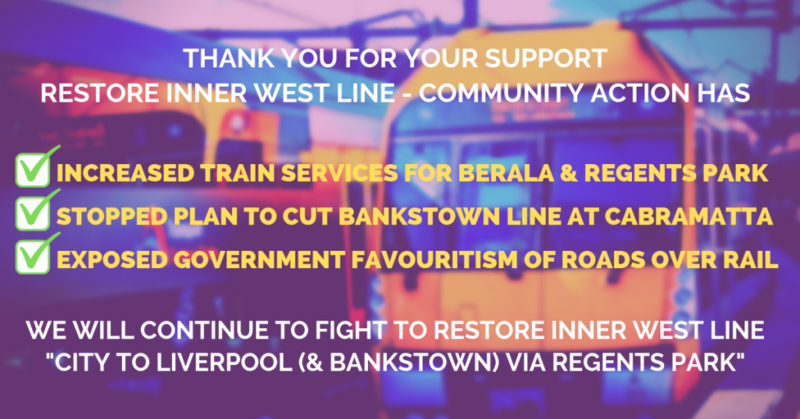 We are also grateful for the advocacy of Councillors in Strathfield, Auburn, Cumberland, Canterbury-Bankstown, Fairfield and Liverpool which have resulted in motions passed and endorsement of the need to Restore Inner West Line – Liverpool via Regents Park. Once again it has only been through the community action efforts of local residents and supporters that we have managed to secure commitments from NSW Labor and The Greens NSW. 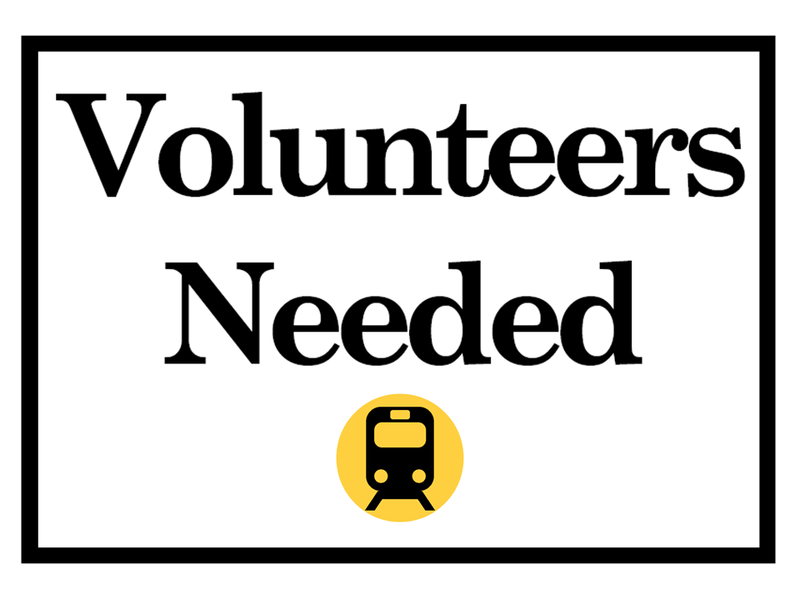 We have never received any funding from any political party or organisation, so it is through the donations from the public and regular commuters that we have been able to continue the fight as an independent community action group.